! (feature_c)http://relayer.s3.amazonaws.com/articles/spreads/4d9f28301306d52d1000011f.jpg!The award-winning digital steampunk series Riese: Kingdom Falling is now playing at www.syfy.co.uk/shows/riese. The story follows Riese, a wanted princess of the Kingdom of Eleysia that has been overthrown by a powerful society called The Sect. The evil empress Amara has proclaimed Riese a traitor, who must evade her pursuers with nothing but her wits and the help of her wolf companion, Fenrir. Riese is set in a futuristic steampunk dystopia and to celebrate the series we’ve taken a look at the top ten films of genre. Sit back and enjoy a round-up of the ultimate examples of retro-future films to hit our screens to date. The 1927 German expressionist film is set in a futuristic and dystopian society and explores the conflict between workers and owners through a capitalist allegory. Ok so it’s not exactly light and fluffy, but if you want to get clued up on steampunk this is essential viewing, with a central feature of the film being a gigantic underground machine that controls the lives of the citizens above ground. There’s trouble at sea in Disney’s 1954 sci-fi adventure, which gets extra steampunk points for being based on the novel by the godfather of the movement, Jules Verne. It’s all about the Nautilus here, the man-made “monster” ship that’s been praying on fleets in the Pacific Ocean, with the crazy Captain Nemo causing chaos at the helm of the metal killing machine. In the last of the epic trilogy, Doc is stranded in 1885 so Marty hops in the DeLorean to go back in time to rescue his mentor. Cue a whole host of fantastical technology being used in an anachronistic 19th century setting, not to mention Doc and his new lady arriving in a flying, time-travelling steam train in the last scene of the film – now if that’s not pure steampunk then we don’t know what is. The critics may not have thought much of Barry Sonenfeld’s 1999 Western starring Will Smith and Kevin Kline, but for steampunk aficionados, it’s a veritable feast of bizarre inventions – with spring-loaded notebooks, giant mechanical spiders and steam tanks flying about all over the place. Plus it has the kudos of being based on the 60s TV series of the same name, one of the earliest manifestations of the steampunk movement. The Nazis get a sci-fi revamp and the monster Hellboy is born in Guillermo del Toro’s 2004 hit. In true steampunk style, plenty of mad science and weird and wonderful technology comes into play as he protects the world from paranormal beings, while working for the government in a technology-heavy parallel reality. 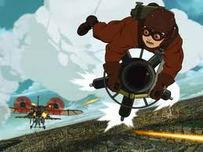 Love it or hate it, films don’t get much more steampunk than this 2003 comic book adaptation. The action adventure combines several of the signature 19th century characters of steampunk, such as Dorian Gray, Captain Nemo and Dr Jekyll/Mr Hyde. It also pays homage to their famed creators – H.G. Wells, Sir Arthur Conan Doyle, Oscar Wilde and many more – as Allan Quartermain leads his superhero team to battle the technological terror known as “The Fantom”. If you want an introduction to steampunk anime then this is your go-to film. Set in 1860s Britain, the Japanese adventure sees a young boy being chased by the government after his inventor grandfather sends him a mysterious piece of machinery called the Steam Ball. Cue steam-filled Nazi’s (again! ), a huge arsenal of retro-future weaponry and a big red chunk of a devil child and you’ve got one Hell of an adventure. A murky, Victorian-era London is the setting for Christopher Nolan’s ode to steampunk, as warring magicians Borden (Christian Bale) and Angier (Hugo Jackman) attempt to invent and build bigger and better scientific machinery to out-do one another. It’s a triumph of a film, and the device for the teleportation illusion should get steampunk fans particularly excited. The adaptation of Philip Pullman’s fantasy novel is set in an alternate universe where bears talk, daemons embody your soul and the machinery for transportation makes cars look like penny farthings. Steampunk seeps into every aspect of the film, from airships and separation chambers to mechanical spy flies, not to mention the all important golden compass itself. Forget the controversial casting of Jude Law as Dr Watson, Guy Ritchie really made waves with the addition of some straight-up steampunk to his adaptation of the classic literary figure. As well as some very spiffy costumes, the steampunk element is most apparent in the dastardly Lord Blackwood, whose plan for technological terror on the world involves the very futuristic Infernal Device. See the latest entry in the steampunk genre with the 10-part Riese: Kingdom Falling at www.syfy.co.uk/shows/riese.